2004 Keuka’s Boss & Company (Queen) was bred to her Grand Sire NFC, NAFC, FC, AFC Pal Joey (Joey) by way of surgical insemination as Joey was then 14 years old. Queen is my personal gundog. She is a small Gordon (40 lb.) well built, extremely intelligent, very athletic, capable, intense and eager to please. Queen has a very strong people attachment and when she hits the field she becomes a bird finding dynamo. Queen was one of the moderate sized females in the 2001 litter. 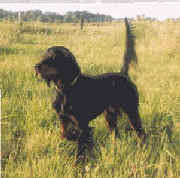 Conformation: Moderately fine boned, nicely proportioned, very nice head, good run, tail carriage(12:00 to 1:00), nicely marked (darker), medium brown eyes. Demeanor: Dominant (bossy to other litter mates), very inquisitive, likes one-on-one attention, boldly explores while keeping track of the boss, intense. Attitude-let’s go do it. This one has the potential to make the hair on the back of your neck standup when she points (have seen her lean right in to it with tail at 12:00 straight as a string). She is steady to point and held for a minute when timed. She turned into a hunting fool. She seems somewhat aloof from her littermates. Her registered name is Boss and Company. Queen and Parker both enjoyed a fall hunting trip to South Dakota and did well.. Queen will be Tom's personal hunting and breeding dog, since we lost her mama Genie to a road accident in the spring. Queen is so identical to Genie, she has the honor of wearing Genie's blue collar. His title speaks volumes. He is a phenomenal performer. Joey is Queen's Grand Sire as well as the sire of this litter. 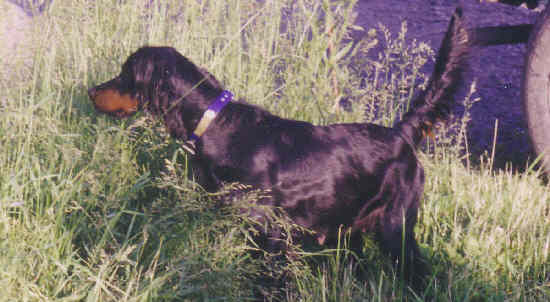 His consistent outstanding performances have earned him the Gordon Setter Club of America Gundog of the Year award for 4 years.